In our latest post about Elle&apos;s investment decisions we reported how she insisted on purchasing GoPro stocks. I warned her about the risks but actually found the trade not so bad. 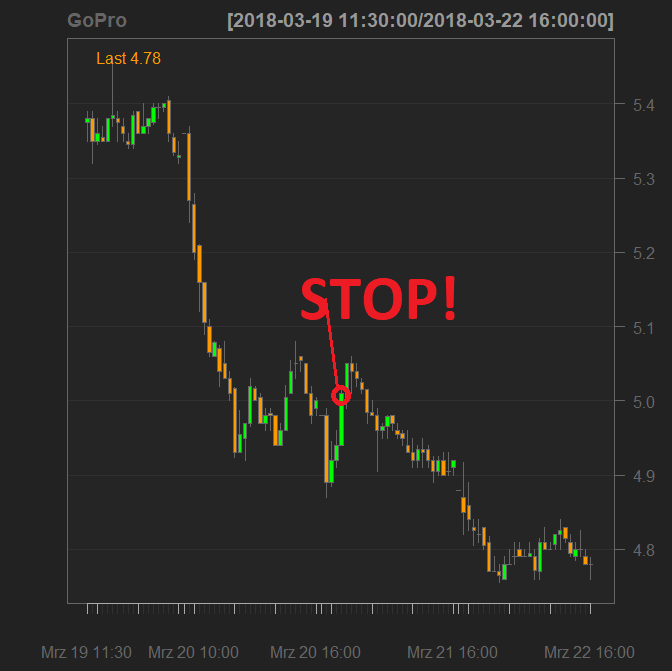 In the beginning it was really good: in spite of recent turbulence on the market the GoPro stock remained stable and even grew ... till the 20th of March 2018, as I had to trigger a stop-loss. Ironically, I have, in a sense, exceeded my authority since we agreed with Elle that I will sell the stock if it drops below $4.3 (being just 7 years old Elle cannot yet perceive the stop-limits in terms of percents and the maximum drawdown). However, I dared to commit this action since the support level at $5.0 was clearly broken and the current market sentiment is generally bearish (Donald Trump may provoke a trade war with China). "Fortunately", GoPro stock continued to fall thus it was not too hard to explain to Elle that a "premature" stop-loss was likely for her own good. 1) we had to pay twice the broker fee of (€0.5 + €0.07), i.e. €1.14 in total, which is not negligible in relation to this small stock position. Additionally we will have to pay about €0.3 for a so-called modality fee by DeGiro. 2) We won a little bit on currency exchange rate but since currency conversion is also not free of charge, we made an additional small loss. 3) Our total loss is 89,76-2*(0,5+0,07)-97,01 = -€8,39. This may be easily checked by subtracting the balance on 20.03.2018 from the balance on 23.02.2018, i.e. €113,51 - €105,12 = €8,39. In relative terms it is about 8.7%, i.e. pretty much! And the modality fee will be charged extra. 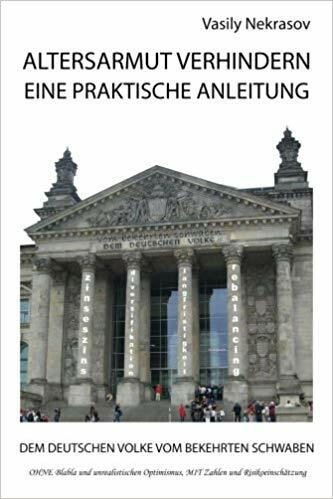 That&apos;s why we decided (and Elle agreed) to stick, so far, to the "free" ETFs on XETRA (XETRA is the domestic stock exchange, so there are no modality fees for it according to DeGiro term and conditions). 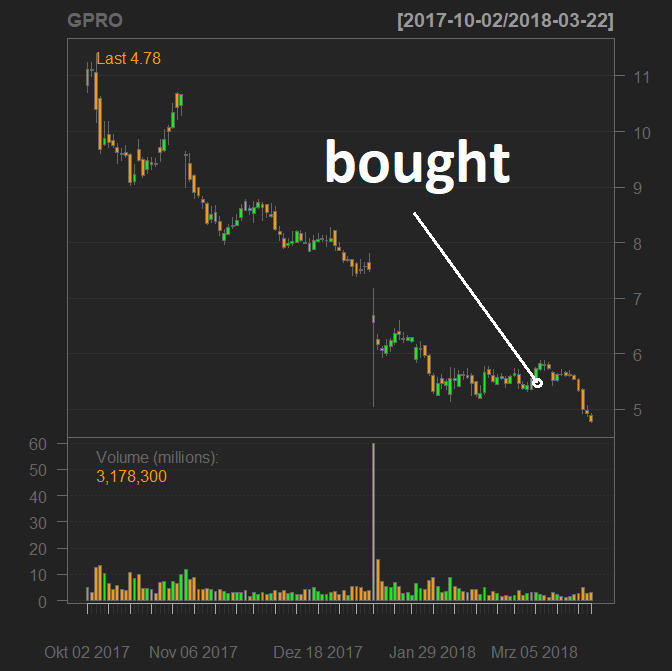 Buy the way, as you can see from the statement of account, the money that we got from selling GoPro stock were successfully invested in a Silver ETC (and we already won back 1,5%). We also invested the March installment in a DAX ETF (iShares CORE DAX UCITS ETF, DE0005933931). Of course it does not mean that we completely refrain from stock picking. We merely postpone it until we accumulate enough capital to disregard the broker fees and until Elle will, herself, be able to read the cryptic account statements that you have seen above :).